You may recall my bitter moans last week about how when presented with a rare opportunity to spend an indecent amount of time playing with makeup, I came up with something that looked no different from my everyday makeup. So this weekend, I grabbed myself by the balls (cough) and reached for my brightest, scariest palette. Innit gorgeous? And I’m sure it shouldn’t really work against my skintone… perhaps it doesn’t, but hell… I really love it anyway. Don’t laugh… this is WAY out of my comfort zone nowadays. 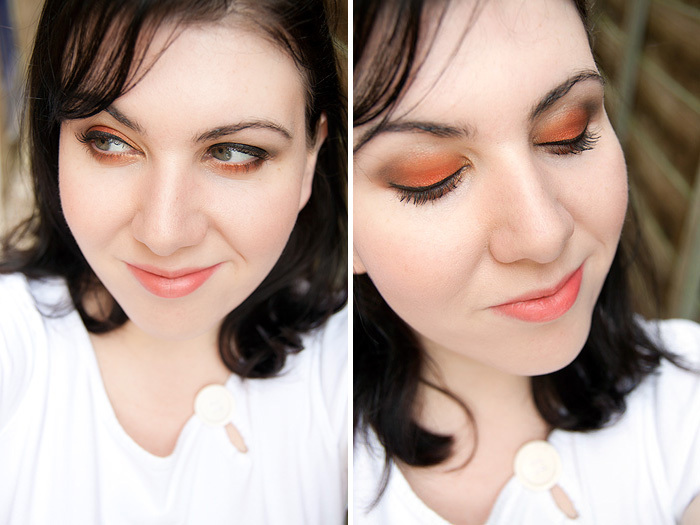 I know I look super-snooty in the ‘looking down’ pics but you can’t see the ORANGE otherwise ‘cos of my hooded lids! When was the last time you stepped out of your comfort zone? I may not be in your comfort zone but I still think you can pull it off. You look beautiful. I love the smoked out orange its sassy or as she wrote “snooty” lol! Bringing the orange e/s under the eye really opened them up! NARS has such great products. I replied to this comment because purple comes in many different shades and tones perhaps if you try a lilac or lavender purple with either a white base (for matte e/s) or an iridescent or cream shimmer base (for satin/pearl/shimmer finish eyeshadows” it wont look so much like a bruise. Also if your eyelid area has very thin tissue and some people their small veins can be seen. Concealer can cover them and neutralize that area so that the eyeshadow you use shows up true to color and doesnt blend in with your skin and look like a bruise. Lastly, if you feel its too much try just using a shimmer e/l in the lower water line (keep the color bright)…and not using the shadow on the lower lid. To get your other pop of color place a gold/ silver or shimmery white e/s at your inner tear duct. Ahhh I lurve purple… taupe/purple… WIN! I’m sure I know the answer to this… is it to avoid red purple or blue purple if you get the bruise effect. Damn my puny brain. One of em! Stepping out of your comfort zone definitely worked for you – this is stunning, and suits so you well! I genuinely love this! Beautiful colours on you and nicely applied! I love it! It works so well with your skin! you should TOTALLY do looks like this more often. Personally, I would do a little less orange under the lids and opt for a more pinky lipstick. but in any case, a little color never hurts! This really brings out your eyes. Beautiful! Thanks Rosie, yeah the orange is opposite to green isn’t it so makes it POP! I think it looks great. Also, aside from the make-up, you have the most beautiful sking and eyes. DAMN YOU! Thank you Kirsty, I really don’t have great skin though! It’s not awful but definitely in the “could be better” camp! I just know how to capture a photo in flattering light! It might be out of your comfort zone but the look really does look good on you! The subtle coral lips perfect the whole look imo. I love this! You look lovely! Yeah, that’s a good idea… I might try that with another bright, thanks Rina! You look absolutely stunning but then you always do! I agree, I think this looks gorgeous :)I too would probably ease off on the orange under the eye a touch but otherwise I love the blending, it would be awesome for a night out! I think it suits you Well done for stepping out of your comfort zone! I think you look beautiful in this colour. Btw, what lipstick you are wearing? You look GORGEOUS! seriously this color looks amazing on you! Gosh, I want to just steal your face right now. This has worked so wonderfully for you. Awww thanks Sydney (you’re welcome to my face LOL!) I will definitely be a bit bolder at least for the Summer! Eee, I love it! You should do this more often. You were very brave – I love all the orange under the lids. Gorgeous! This look is absolutely stunning. Can you think of a dupe for the orange colour? I really really really want to give this look a go! You should definitely wear warm colours more often, that looks beautiful, especially with your skintone! I love this look on you, it’s gorgeous! You look beautiful! Great job! What dark color did you use for the corners / crease of your lids? Wow! That color looks phenomenal on you! Also your hair looks amazing too! Did you change it up since the last time you posted about it? I LOVE that look on you! Fabulous! The lighting in your pics is great too. Do you mind my asking how you take your pics? Sure, I shot these in the back garden in the shade. Just handheld with my Canon 50D. I guess the most important thing was making sure the light was good. A few steps back and I could see that I was getting major shadows under my eyes… I always hold my hand out and see how the light falls. If you can get good light, it hides a multitude of skin sins! 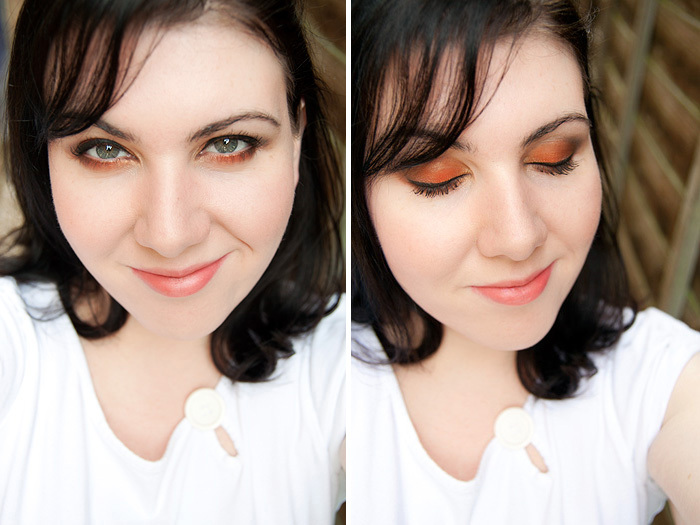 I’d been doing an orange eyeshadow series. Lately I’ve found a lot of cool oranges, so I went with it. Oranges are cool! LondonBeautyReview kinda inspired me actually, she rocks some cool orange/red shades. It’s suchhh a pretty shade and it looks *lovely* on you! You look beautiful! Stepping out of my comfort zone would be blue/teal eyeshadow. I love the color but for some reason I have trouble pulling it off! Thanks lovely, the crease colour is the dark shade out of the Eurydice palette (it was nearest) and the lip colour is OCC Grandma sheered out a bit! Literally an out loud “oh my god” moment – that is stunning on you! And you know what? Your “hooded” eyes are what make it work so well, like a butterfly wing; you only see that amazing orange lid in the seconds when you blink. Creative genius imo, love it. Ahh, thank you my love. I really need to control my use of black eyeliner, that line just gets thicker and thicker to cover up my wobbles! Charlotte, this is AMAZING. You look BRILLIANT. CAPITALS. SUPERLATIVE CAPITALS. Moar plz. Your colouring is very similar to mine so I always like to see what you’re wearing as far as makeup goes. The only change I’d make is perhaps leaving out the orange under the eyes, and using a turquoise eyeliner there as contrast. Having said that, I’m not brave enough to wear orange, haha. Even browns make me look tired! You look great. I love how your hair and the eye makeup compliment each other and make the look pop. Not so crazy about the lip color but that’s because I like vivid cool tones not peachy colors. You look gorgeous you can definitely pull it off! Oh and I have to say I am totally envious of your FOTD taking skills! Wow! I admire your ability to move outside your comfort zone in such a public way. Gorgeous! Quite frankly it’s one of the best looks I’ve seen done with these colors. looks awesome! 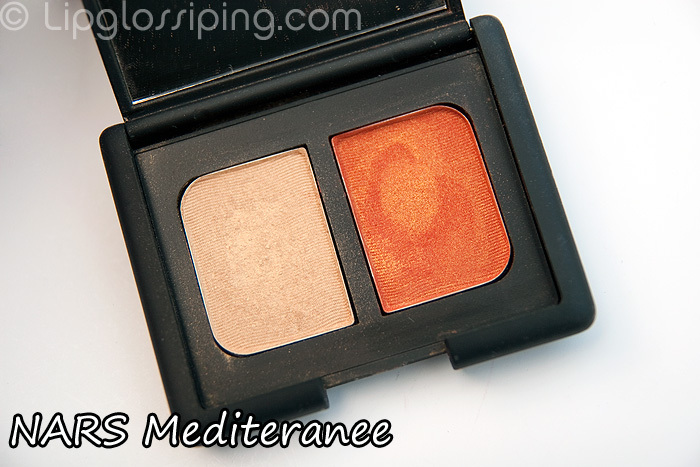 i sometimes am curious about the names NARS gives to their palettes…i think your look totally explains to me the name mediterannee…your look is totally transformed by this combo – and i think it actually works really well with your colouring! Love this look! Your are a doll, and it makes your blue eyes really pop.